Throughout the election campaign Stephen Harper claimed the political high ground on the management of the economy. The surprise is that the opposition has pretty much let him get away with this. During the English Language debate the first question focused on $6 billion tax cuts to corporations. Harper said there were no tax cuts ‘right now,’ something that was only true for the second. Corporate taxes were cut from 21% in 2008 to 16.5% now and will be further cut to 15% in 2012. Layton and Ignatieff more or less abandoned the issue and did not press Harper about the inefficiency of these cuts. The week before the debate both the Globe and Mail and the Canadian Centre for Policy Alternatives studies showed that corporations mostly hoard the money they save from the tax cuts and don’t use it to reinvest in the economy or create new jobs, the supposed reason for the cuts. Munir Sheikh, former head of Statistics Canada and of tax policy at Finance Canada, showed this week that the real winner of the Canadian corporate tax cuts is the U.S. Tax cuts here give corporations bigger profits and because the US corporate tax rate is about twice as high as ours, US corporations in Canada then just pay more American tax on their Canadian profits. This transfer from the Canadian to the US treasuries amounts to between $4 and $6 billion a year. Harper talks economic conservatism, but the record doesn’t show it, either in deficit reduction or spending actions. When the Conservatives took office they inherited a $13 billion surplus. Cutting the GST by two points turned this into an almost $6 billion deficit by 2008. Now the deficit is over $55 billion. A deficit isn’t always a bad thing, particularly when a country goes through an economic downturn as we did. But cutting government income during a recession is asking for trouble and that is what we have. Both the IMF and the Parliamentary Budget Office have warned that Canada now has a structural deficit. This means that without big revenue increases the deficit becomes permanent. Since Harper is promising a balanced budget by 2014 cutting programs is about the only solution for him. Harper is also a big spender and is committed to some expensive projects in the future, including something on the order of $35 billion for new fighter jets and $9 billion for prisons. It’s the kind of economic conservatism typical of the Bush presidency, one that cut taxes at the same time it spent lavishly on the military. But at least with Bush the money was spent in the country, with the F-35 spending the money will mostly go to the U.S. That’s economic stimulus, but not for Canada. This post was published in The Province today. 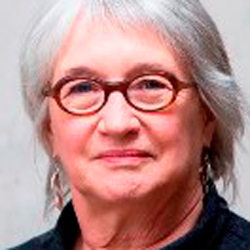 Marjorie is Professor of Political Science and Women’s Studies at SFU.